The Donegal defender can see why Celtic and Liverpool would be interested in his All-Ireland winning coach but is confident that he will stay. 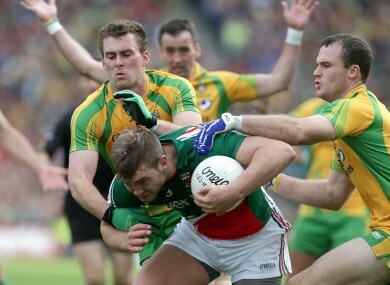 Neil and Eamon McGee combine to tackle Mayo's Aidan O'Shea. DONEGAL DEFENDER EAMON McGEE says he has ‘no fear’ of losing coach Jim McGuinness to the world of soccer any time soon. McGuinness told Highland Radio on 8 October that taking up a coaching role at Glasgow Celtic ‘wouldn’t be something that would scare me’. The All-Ireland-winning coach revealed that he had not been approached by either Celtic or Liverpool, another side he was linked to, but added that he was ‘flattered’ by his name being associated with the Scottish champions. Speaking to TheScore.ie, McGee declared, “I’m not surprised after all he has achieved and what he has done with Donegal that he would be linked with these jobs but I think it is all rumours. His ethos on the whole thing can be taken into any sport. I think people realise that and they’re putting two and two together and they’re coming up with 44. The All -Ireland victory and the dominance of Donegal over many of their opponents this year has led to All-Star nominations for 12 of their players and the trio of Karl Lacey, Colm McFadden, Frank McGlynn up for Player of the Year. “I don’t think it would be fair to single any one of them out,” said McGee. “They’ve all made contributions. I’d love if Colm, Karl or Frank each got an award but at the end of the day it’s just going to be the one. Neil McGee, who earned his second All-Star nomination after an impressive year in the Donegal defence, echoed his older brother’s comments. He told TheScore.ie, “There have been other years, like last year, when you had the Brogans (Bernard and Alan). There was no question about them being out on their own. Speaking about his nomination, and that of his brother, he added, “It does mean a lot to you. No player is going to say he doesn’t want an All-Star. At the start of the year, that is in your head too. Email “People are putting 2 and 2 together and getting 44 - Eamon McGee on Jim McGuinness' future”. Feedback on “People are putting 2 and 2 together and getting 44 - Eamon McGee on Jim McGuinness' future”.